Order complete! Now bring on “Ice”!!! Ordered Needle very early on yesterday… I can’t wait to display her next to Longclaw! Fall will be an exciting time. Very good points in regard to the design of Needle. I can’t afford to buy these swords, but I do like to see what you guys come up with for each one. I don’t really agree with the style of the wolf’s head pommel of Jon’s sword (although I still think it looks good), but I have to totally agree with the way you’ve done Arya’s sword. 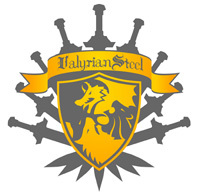 Well done Valyrian Steel, you guys are doing great! how is the production of needle going? r we still looking at sept or oct for arrival? Do u have any info on ice? and if so what would be the next product after it? Keep up the great work! I love the needle desighn but its funny I always imagined needle being more of a classic rapier. Any final words yet on when Needle will ship? So, it’s the end of October now, when can I expect Needle to ship? I’m a little anxious! We hope by the end of november… I know I know… right before production GRRM changed the length a little bit and that delayed thingss. I placed a preorder, but I moved since I’ve placed it. I’ve sent two e-mails and left a voicemail, but don’t know if you’ve received my new address. Can someone please contact me? I want to make sure my order ends up in the right state!